Rain. Much cooler. High 54F. Winds NW at 10 to 20 mph. Chance of rain 90%. 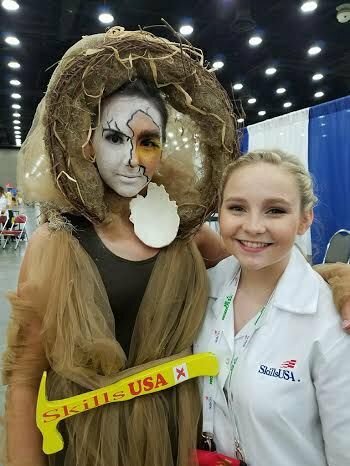 Rainfall near a half an inch..
Ardmore High School student Katie Moses, right, poses with model and Elkmont High School student Emily Ezell at the national SkillsUSA competition in Lexington, Kentucky, last week. Moses and another Limestone teen were awarded professional certifications for being named to the top 10 in the nation for their trades. Two students representing Limestone Career Technical Center brought home praise for their school last week at the SkillsUSA national competition. Katie Moses and Brandon Jinright were awarded Skill Point Certificates for their top 10 finishes at the competition in Louisville, Kentucky. Moses earned a ninth place spot in the esthetics competition and Jinright placed eighth in graphic communications. With the Skill Point Certification, Moses and Jinright can add to their resumes they have earned a nationally-recognized level of mastery in their skill. For two students to place among the top 10 in the nation in their respective fields tells tech school instructor Gladys Black that Limestone County is going in the right direction. Black said Moses was initially disappointed with her results, but explained to the teen that first, she won a gold medal in the state competition, which earned her the trip to Kentucky. Next, out of the 6,000 students from all 50 states and U.S. territories that competed at SkillsUSA nationals last week — who also won gold medals — she was singled out among the 10 best and can carry that designation into any job interview. “You don't realize how big this is,” Black said to the teen, adding the girl then perked up and held her head high for her accomplishment. To Black, last week's SkillsUSA competition reinforces why she went into teaching at the tech school. There's no feeling like helping a young adult succeed in something they choose to do, she said. Many high school students are bored with sitting in a classroom all day and the subject matter doesn't challenge them enough. At tech school, students learn new thinking skills as well as technical skills in a trade or subject that they choose. By getting out of the desk and putting hands on the subject material, those students once bored now have a strong leg up on their post-high school life, Black said. With Moses and Jinright holding their professional certification, Black said she feels the accomplishments help change minds on what career tech can do for kids.